Just had a phone call from an EXTREMELY excited Robert Goler. Robert headed up to Wagga last night and got a nice lightning show and this morning was sitting just W of Junee watching some large congesting cumulus and hello boys a funnel pops out of the base. The cell was precipitating to the S and the funnel appeared from RFB to the N of the precip. It extended half way to the ground before being enveloped in rain. Soon after, a second, smaller funnel appeared from the RFB and extended 1/3 of the way to the ground. Last I heard, Robert was driving (fast) to get himself closer to this cell. Radar at the time shows a nice little patch of pink on Wagga Local which appeared out of nothing so it's probably a fairly strong cell. We called the Sydney BoM from here to report it to them (be interesting to see what happens with this). Due to the low contrast of situation, I enhanced the pics a bit, but the prints are clearer, and with what I saw with my naked eye, there was no doubt. Thanks to Macca and Jane for their updates while out on the field. There is certainly a good possibility it touched down, going by your photos that have been enhanced. The funnel looks to have extended over 1/2 way... who knows what was going on behind the trees ! Great you got out there to see it! and a nice report too. That's an excellent chase and excellent result. That proves that this system was one hell of a system. The structure you have there was classic. I am wondering was it a larger "coldie" type of storm (supercell). Just unclear from the photos as to judging the size of the storm. Great report. It is interesting to see that in the last two years with chasing and ASWA that wall clouds and tornadoes have been spotted. This is adds to it. Well done. I think Roger's pictures are a good sample of many more funnels and tornadoes to come from the Aussie crew, they have always been there and we are just beginning to catch them. I thought earlier in the week that system had good storm potential, albeit I was thinking more North. I wonder what this system would have been like had it occurred in October or November, it would have been supercell city. I'm having a little trouble with an event such as this one which Robert saw near Junee on Saturday. I'm not too sure about this being a supercell for starters. From the description Robert gave me at the time and as is displayed in his report, I am under the impretion that the funnels didn't come from a Cb but from a Cumulus Congestus. It's a diffiucult event to label as such but I think after seeing events such as this myself and hearing several reports of these events at other times I think a label may be necessary for future reference. I'm not great with the term "landspout" but honestly I think there is no better term for it as yet (if i come up with one I'll let you know). Going by my personal experiences (Nov 11 2000 where Chris Gribben and myself saw a very similar event take place near Swan Hill in NW Victoria), I have noted a few similarities between the events. Trough line (convergence zone?) very close to the vicinity of the funnels. Lots of moisture in the low levels and hence a low LCL. Moderate low level speed shear (not sure of directional shear). The BoM was informed at the time of both events yet no warning was issued. This last point raises a few questions. I know that at the time of the reports the guys at the BoM would be able to see that there are no Cb's in the given area so you would expect them to assume it to be a landspout/land funnel. Are land funnels considered less likely to touch down than funnels spawned from a thunderstorm (whether it is a supercell or not)? Are landspouts considered such a small threat to property and lives that no warning is required? Did the BoM realise that these events were far enough from populated areas and would be short lived enough to not cause damage? I'm not having a dig at the BoM here - far from it actually. I'd like to know if there is a landspout action plan at the BoM and I'm also trying to promote discussion to see if something should be implemented to deal with events like this (if the need is there - ie. if these landspouts are strong enough to cause significant risk to lives and property). I'm not saying that they should try and forecast these events as that would be impossible. I just think that perhaps these landspouts events should be looked at a little more closely. From what I observed near Swan Hill, I would most definitely not call it a supercell - it developed more from a strongish cumulus congestus. The base area around the funnel remained fairly flat and due to our distance from them (there were several funnels) we couldn't make out any rotation at cloud base. Michael Bath and Dave Ellem observed a tornado near their houses in NE NSW earlier this year some time too which could possibly be of a similar nature. From the photos of that, the LCL was relatively low, the storm (it was a Cb in this case - although MB suggests there was no thunder - intereting) was low topped for that area and it also showed some, if not all of the charateristics as mentioned above. Anyway - I hope this can promote some discussion regarding the formation of landspouts (which are tornadoes but probably not formed in the same way as supercellular tornadoes), the conditions in which they develop and also in the treatment of them by the BoM. I personally don't believe this was a supercell either...although it's not the main topic in question here - I personally believe that "supercells" (ie the presence of a mesocyclone), is not confined to just thunderstorms with anvils, rather, something as benign as a coastal shower can also house a mesocyclone. An example would be looking at Melbourne's "Cold air CB's" and Brisbane's "Coastal showers" - both are probably around the same height (15,000-20,000ft), yet both also occur in similar (but not analagous) conditions - for example, Melbourne requires a strong SW'ly stream and the convergence on the coast, the relatively warm SST's (compared to the air) to provide lapse rates), strong low level shear (often with strong mid-upper level shear), and the presence of a strong upper level low/trough. Brisbane requires SE'lies, convergence on the coast and the presence of an upper level trough. However low level shear is frequently strong (not unusual to see 850mb winds at 40kn), and strong mid-upper level shear. However they rarely produce anvils in Brisbane because the freezing/glaciating level is not low enough, where as in Melbourne the freezing level can be extremely low (less than 5000-6000ft). Melbourne is not unknown to get "cold air supercells" (a term I dislike, but will come to this later), that produce funnels/waterspouts and Brisbane is not unknown to get "coastal showers" that produce funnels/waterspouts too. No they don't have to be supercellular to do so...but I'm fairly confident that in both cases that mesocyclones can and do exist. The observations you have made are interesting...but before I go onto that, I'm going to give an opinionative answer to the main question here of why the BoM don't warn for landspouts (or potential landspouts when funnels occur) - (and don't seem to know when they are going to occur). That is that the current understanding of the structure of funnels/tornadoes and mesocyclones is probably incorrect. I am of personal belief that funnels/tornadoes are extensions of vorticity in convective clouds, and I don't believe the current supercell model indicates this very well. The current "accepted" supercell model suggests that you require good low level shear, overshot by a stronger jet above that in the same direction. This then creates horizontal vorticity (similar to that of rolling a rolling pin by pushing it with your hand on top). Once this horziontal tube of vorticity has been formed, an updraft may push upwards into it, therefore pushing through the middle of the horizontal tube and then through that you'd have two counter-rotating vorticies in the vertical direction. The cyclonic rotation is then most likely enhanced by any backing (or veering in the Northern Hemisphere) of wind shear, and the anti-cyclonic rotation would be destroyed or weakened. I find this supercell model too strict in its formation, ie, too many tubes, too structured, and it only explains a small number of supercell/mesocyclonic/funnel/tornado cases. Keeping in mind that (IMO), all of these are extensions of vorticity, they would all occur in a similar way and the same theory could be adopted for all cases. If you look at the list of "ingredients" you gave, many of them are consistent with larger supercellogenesis and tornadogenesis, but not quite that extreme. IE - all the ingredients are there, but not enough of them - and certainly not enough to satisfy the current supercell model. The current supercell model requires a very specific set of conditions, it doesn't explain why we get funnels/mesocyclones in times when we have poor instability, but extremely strong shear and steep lapse rates. Nor does it explain why we get funnels/mesocyclones in times when we have very large instability areas, but with poor shear. A poor analogy to use (but I'll use it), if you bake a cake with half the ingredients, does it mean you won't get a cake? No, it just means the cake will just be half the size! But if you replaced the cup of sugar and cup of salt with 1.5 cups of sugar and 0.5 cups of salt, you'll still get a similar result (although the cake won't taste the same :) What I'm getting at, is that funnels, mesocyclones etc are all a matter of scaling. Tornadoes/funnels/mesos/supercells/landspouts whatever they are, are all (IMO) formed by fundamentally the same process and are a matter of scaling (ie, some are just bigger/stronger than others). And you don't need to have every ingredient there, because other ingredients can help make up for the ingredients that are not present. Last year I jotted down some notes - I was unhappy with the current supercell classifcation scheme of "cold air" and "warm air" because they weren't entirely true. I was also not happy with the current supercell model, and when I looked at socalled "cold air" and "warm air" supercells, I noted a few things. 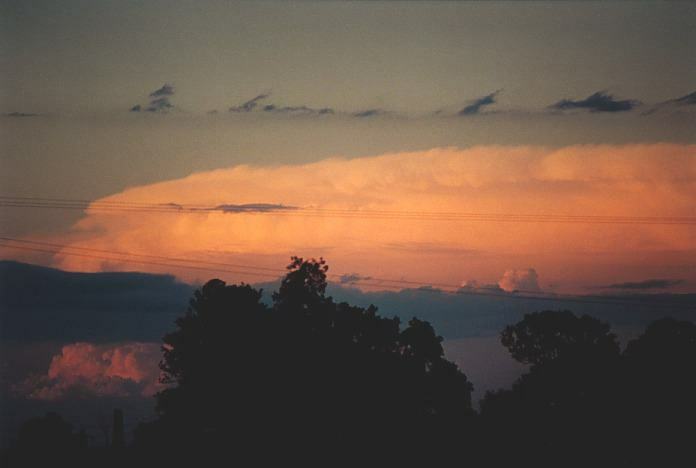 By Australian definitions cold air supercells have generally been termed to be supercells that occur in cold air (these generally occur with very strong shear, and strong lapse rates). But the cold air itself does not so much induce the supercell, and you don't need cold air for that to happen. Only steep lapse rates and high shear. Warm air supercells were considered to be "anything else." But it still doesn't explain everything, and if shear and instability are two big ingredients to at least mesocyclone development, then if we can have "cold air supercells" were high shear is thought to be the primary factor - then surely it should also occur in areas of large instability. IE, if we can get "coldies" (cold air tornadoes), do "warmies" (warm air tornadoes) also exist? The answer would be yes...but the terminology used here isn't indicative of what happens. I broke down supercells into three categories of formation. Convective supercells, shear supercells and combination supercells. All three names indicating the primary source of their vorticity. I was interested in the PV equation, and how it may apply to mesocyclones/funnels. (Lamda + f)/D = PV) Where f is the constant negative value in the Southern Hemisphere for any given latitude, and lamda being the absolute vorticity. If a column of air (D) increases, then lamda must become more negative to compensate, hence more cyclonic in vorticity. If the column of air (D) decreases, then lamda must become more positive to compensate, and we get anti-cyclonic rotation. There are several ways you can stretch a column of air, they include: stretching by shear (convergence & confluence at the surface, and divergence/diffluence aloft), you can also stretch through a rapidly ascending parcel of air, in particular an area of high delta-CAPE per vertical height. IE - as you increase, the atmosphere increasingly gets more unstable, so essentially you have air accelerating faster than the air below it, and that stretches the column of air and enhances any vorticity present. The backing and veering part also plays its role, but further enhancing a column of air that has begun this process. In cases when the backing or veering is so strong, it may not need much other stretching. In cases where the instability is so strong that vorticity becomes enhanced significantly we then see that we don't need other processes as critically as we do normally. Of course, you can have "equal" amounts of these ingredients, or approximately equal amounts (ie, one doesn't really dominate the other), and we then have combination supercells. If you look at this model, then you can apply it to wide variety of situations, to supercells, to tornadoes to funnels etc, that's if you accept/believe that they are related/connected to each other. It would certainly allow for funnels/land spouts to form under rather benign convective clouds, or from raging supercells! But if you look at this, you could also deduct that a "land funnel" (ie, non-supercellular funnel), would probably not be as likely to descend and reach the ground as a supercellular funnel. Similarly since landspouts are normally not as strong as supercellular tornadoes - you would expect funnels to behave in a similar fashion, and if they aren't as strong, one would expect them to have a lesser chance of eventually reaching the ground. I think though, there is a lack of understanding in funnels - possibly because most of the study comes from the US. And to me it seems clear that many events in the US such as landspouts/"cold air funnels" are passed as "normal events" and that little study has gone into other sections. It seems that Australia is "leading" the study into "alternative tornadoes" if you could call it that, in that there are a variety of ways they form. I hope this isn't too boring/long for people...these are just my opinions and a personal conceptual theory. Couldn't agree more! The whole "coldie" vs. "warmie" thning has bugged me for years. If by coldie you mean totally within the bounds of one air mass (or warmie for the same reason) then it seems odd that supercells form at all by conventional mechanisms. Just yesterday I read (admittedly on WX-CHASE) that the KS supercells formed on BOUNDARIES (my capitals) of mainly temperature lines (i.e. at quite low temps for Australian conditions - I think 65/60 F was mentioned) - i.e. frontal I guess. So what is "cold" and what is "warm"? Seems awfully relative. Just to let you all know, Anthony has run this theory of "stretching of a vertical column of air" by me several times and I've been waiting ever so long for him to mention it publically - I laid the bait and he took it like a hungry fish!!! Brilliant work Anthony. I hope that over the coming years I can help you through my thoughts, criticisms and observations as you develop this theory further. Just as a further comment/example which questions the current theory of supercell initiation.....think about the situation where you have STRONG shear and limited instability. The current theory suggests that the horizontal vorticity is thrust into the vertical by an updraft and hence initiating the rotating updraft. If the instability is only limited, wouldn't you expect the updrafts to be too weak to sustain the upward motion to the extent where the vorticity is tilted to the vertical and also to maintain this for a long enough period for the cell to become organised to the extent where the mesocyclone reaches cloud base level? On the other hand, think of the situation where there is virtually no shear (an event example is that of October 19th where a meso and funnel persisted on and off for an hour over Geelong in virtually a no shear environment). If there is very limited shear, the current theory suggests the requirement of greater instability for supercellular tornadoes. I'm not 100% sure how this fits the current theory whereby how can you have a weak horizontal tube tilted to the verticle and then have the shear (if any present at all) maintain the rotation of the updraft for a period long enough for the cell to generate rotation at cloud base. In both circumstances you would think that another mechanism is at work, whether this be in conjunction with, or totally separate to the current theory. While currently I can more clearly follow the theory put forward by Anthony Cornelius, I am happy to hear further explanations/comments/criticisms of both theories and any alternatives which people may have. I hope this topic will generate some serious discussion. Great discussion, most of which I agree with totally. Trouble is, words like 'coldie' have entered the local vernacular, ond once part of the argot, it's very hard to get rid of terms like this, no matter how nebulous their scientific justification actually is. Also, its a nicely descriptive term for the visual observer, describing a 'coldie' in terms of objective atmospheric measurements may be difficult, but most of us know one when we see one! Macca - " In both circumstances you would think that another mechanism is at work, whether this be in conjunction with, or totally separate to the current theory. " I agree with this statement...the trick is to find out what the "other" mechanism is which creates the funnel. I'm probably way out of my league here but its just a thought.... hope it adds to this interesting discussion. This is a really interesting discussion - hopefully I can add a few relevent comments and criticisms. As stated, the current "definition" of a supercell requires the presence of a mesocyclone. However, many other modes of convection (as Anthony states, even coastal shower cu) may possess rotation on the scale of a mesocyclone (typically, 1 or 2 km). But these are not normally as intense (usually measured by shear or maximum differential velocity) or as long-lived as the meso circulations associated with supercellular convection. Hence most supercell definitions try to take this into account by setting some arbitrary threshold of mesocyclone intensity. The theory of vortex-tube tilting and stretching in the updraught is a well accepted one, and has been reasonably well proven by observations and modelling to explain the formation of _mid-level_ mesocyclones. However, the presence of a mid-level meso, no matter how intense or long-lived it is, is certainly no guarantee of tornadogenesis. Far from it. Probably as many or more that 90% of storms with mid-level rotation do not produce tornadoes. With the presence of a low-level meso (which reduces the data set a lot), the figure reduces to perhaps 50%. The theory of low-level mesogenesis is a little different, and entails the baroclinic generation of horizontal vorticity in the inflow air which approaches the storm along the outflow boundary (basically, the temperature gradient, or more correctly the density gradient, between the warm ambient air and the cold outflow of the storm, or a neighbouring storm, produces rotation about a horizontal axis - also known as solenoidal production). This is then tilted and stretched by the updraft. Why do some storms with low-level mesos produce a tornado while others do not? That is probably one of the hottest questions in the severe storm research community at present, and is not known. One very important aspect of the theory you have overlooked, is the production of dynamic (ie non buoyant) pressure gradients due to the mid-level rotation. Basically, (in the southern hemisphere) a cyclonically rotating mid-level vortex will produce an area of lower pressure on its left flank, and higher pressure on its right. This contribution to updraft strength can be as large or even larger than the buoyancy contribution in high shear/low buoyancy environments. The stronger the shear, the stronger the dynamic lift. One other crucial factor to bear in mind is the representativeness of observations. It is all very well to say here's some convection in a low shear environment, however this is usually based on one or two soundings, or global model output. Neither of these can hope to resolve the plethora of small scale boundaries in the atmosphere (examples include sea-breeze circulations, outflow boundaries from previous convection, and even differential heating along a cloud boundary). However, these very boundaries can be extremely important sources of ambient horizontal and (perhaps less importantly) vertical shear. All of which is available for tilting and stretching in a strong updraft. If the storm in question happens to be moving along the boundary, rather than across it, this ambient vorticity may be available to it for an extended period. I'm not aware of the background of the Geelong case you mention Macca, but this may be a plausible explanation. There are many examples of days in which observed and forecast shear was weak, SRH vitually zero and yet supercells occurred. A recent study in the states (can't recall the reference off the top of my head) documented a typical large variation of 0-3km storm relative helicity over quite small distances - certainly much smaller than the sounding network of global models could resolve. I think it is important at this stage to keep conceptual models of supercells/mesocyclones and tornadoes well apart. We do not know how one fits in with the other at this stage. With something like 2 orders of magnitude difference in diameter, it is quite plausible that factors important in the formation and maintenance of one may not be as important in the other. The fact that we are only just beginning to get our hands on quality 3-D observations of tornadic circulations means that the understanding is merely in its infancy. You can do all the modelling you like, but without observational verification, you're never going to know how well you're doing - whether you are resolving important phenomena or your assumptions are plausible etc. This large difference in scale is a big problem for the modelling community to overcome. Some very recent studies are attempting to relate tornadogenesis and non-tornadogenesis to the thermodynamic characteristics of the rear flank downdraught - there seems to be some promise here. I hope that keeps the interest going in this discussion! I'll probably think of something else soon, but I'll add that later! One of the main problems I see with the current supercell model, is that I cannot see how it applies to *all* situations. Perhaps a supercell model that covers all situations doesn't exist - rather, there are several ways that supercells/mesocyclones occur and none actually cover a broad range. But certainly I can see how it can be applies to some situations when the shear is "right." I think one of the most interesting correlations I've seen is the CAPE and SRH graph, with tornado occurrences plotted on it for a certain region. The higher the CAPE (measure of instability), the less SRH (measure of speed & directional shear) was needed. Alternatively, the higher the SRH, the lower the CAPE that was needed. I believe they also plotted EHI on this as well (which is a combination of these two with a scaling factor). I believe that most of the study of supercell and tornado models has been done in the US, hence a lot of these models are bias towards "normal" US tornado situations. Where as other tornado producing situations (particularly in Australia), aren't studied nearly as much in depth. I personally also believe that Australian supercells tend to develop in higher CAPE's, hence I guess my slant on adding convection into the process of mesocyclongenesis. In Australia, shear is not normally as strong and directional as in the US. So we need increased instability to help offset it (ie, like a trade-off, I believe the SRH/CAPE tradeoff discussion took place a long time ago here!) Returning to the favour to Macca (aka getting him back for his dirty deed :) - he mentioned to me what I thought was a very logical and good explanation to why shear isn't as good. In particular, the low levels (upper level wind shear can be comparable between the two areas), but in many storm outbreaks, a substantial low pressure system is present with them. In Australia, we get weak lows (ie, 1000-1008hPa) and troughs for many of our storm outbreaks. In the US they seem to frequent in the high 900's, and this of course gives strong pressure gradients in the low levels, helping out with the low level shear. I tend to agree with this lower level jet theory and recently Andrew and I discussed this on ICQ. I feel that we tend to not have the lower level jet of say 30km/hr or more backed up by a wall of westerly winds with a trough or dry line. Our best situations are the trough lines enclosed in a low as Anthony describes. I also feel that to an extent that chasing on the plains around Moree and north and south from there would be interesting to test out. Since chasing has been going, we rarely have had the so called typical conditions that would favour the plains around there which in my opinion would get closer to the conditions that is observed in the US. I think the NW winds feeding in a trough preceded by NE winds are also in interesting scenario with a got jet aloft. In other words a convergence zone. However great this season was for NSW storm wise, I feel that only perhaps one or two systems tended to approach the conditions like some of the weaker outbreaks in the US and they were early November and early December. The early November outbreak in particular even before the Sydney tornado saw some amazing outflow boundary activities on two consecutive days as well as some massive storms. But what happened out there??? One prime example of a system that did produce a lower level consistent fresh to strong jet was the night Mudgee event 26th September 2000. We observed a major funnel and possible tornado if it touched down on some of the hilltops south of Mudgee. Certainly a fair bit of damage but unclear if we had surveyed the correct areas. Of course there was a classic supercell followed by a second supercell within the complex. If people recall the inflow is what really make me take notice - something I hadn't observed in Sydney for up to 10 years or more. It was strong enough to blow over the tripods with camera gear on top. Another example I liked was the one in WNSW and SA in August if I recall correctly - one produced a tornado in Melbourne suburbs. Who knows what happened in the Northern Victoria and WNSW. Also I recall another system that also occurred in August in eastern SA where you had nice isolated massive supercells in a north - south line. I know Anthony and I drooled over them on ICQ. Perhaps these are the systems that are producing the major tornadoes with so much heat available and certainly with a little bit of moisture. Out there though, you don't have a plain forget chasing. Yes we do match it with supercells and some spectacular ones in that. We match it with hailstones well lets say similar - perhaps slightly less frequent. But we do not match it with the frequency or intensity of tornadoes. I think having gone out on some big days and failing to get clear cut cases of tornadoes... ie not straining the eyes so to speak and more or less speculative. When we begin to get the lowering and touch down and dustwhirl activity then we can start comparing. I think the lifting condensation level has a lot to do with this being usually higher. Anyway, time will tell what we can observe over the next few years. I think it is a matter of time before somebody nets a good tornado and then we can study what sort of system produced it. And check out the MSLA! A 979hPa low moving into Western Vic, extending a large front over inland NSW and QLD, with a trough further ahead of this. A large region is under 1000hPa - note the NE and NW winds on the trough as Jimmy as suggested too. One would anticipate a strong low level jet in this case, and a very nice mid-upper jet, and supporting cold air! While it's difficult to guage completely, looking at the MSL, I would expect a joining of the PJ (polar jet) and STJ (sub-tropical jet) to the west of the low, moving to the north of the low's centre axis, and splitting around the high in the south Tasman. The STJ would have probably connected with the other front in the far east, and the PJ would have curved back towards the south in a highly meridional pattern. It is something I would expect to see in the US, most lows tend to slip SE of Australia, especially the more intense ones. Sometimes these intense lows that slip the SE produce smaller/weaker lows over Vic and NSW but these aren't nearly on the same scale as a low such as this one! I certainly believe that Australia is no stranger to supercells and tornadoes - in fact, I believe that supercell numbers may in fact be comparable! But it seems that Australian supercells don't produce as many tornadoes as US ones (perhaps we're looking in the wrong place? Perhaps us Aussies place too much emphasis on the US?) I think the latter does play a part in this, but I think that quite a few Australian supercells tend to be orientated towards HP status, over say classic status. Again it is difficult to say this explicitly because of the limited number of chases in the inland regions. There are a plethora of factors that contribute to tornadoes not being seen by chasers (road network doesn't help for one!) But there's hardly any of us out in the inland regions. In the US, there are hundreds! As I said before, I think our instability tends to be slightly higher, we get large tongues of very moist surface air that still proceed to enter trough areas, with breakable caps - even during summer. But this extra moisture would tend to produce HP setups, over classic setups. Especially in NSW and QLD (more so in QLD). NSW would be somewhat mixed and it would vary on situations. I'm sure I'll raise a few eyebrows here if I say I think that Victoria (and parts of southern NSW), are perhaps the most prone areas to classic supercells. They can still get the moisture, but not as high as further north. However, they have colder air temperatures and (generally) better shear conditions to help balance out this effect. It just seems the further south seems to actually be more prone to the US type events - which is to be expected given that most of the US' land mass is above 30N! In a way, large parts of N NSW and QLD "don't exist" in the US - and they could potentially (and I believe do) play by a totally different set of rules. There have been a few good points raised in this thread. Our middle layers are often too moist. Our caps often too weak. We are not 45'S, I know it is rather obvious, but it is a point too often overlooked. We often get supercell outbreaks over a massive geographic area. Occasionally even greater area I dare say then big outbreaks in the US. My comments did not even go back to a few years ago and certainly that 29th September is one of the most significant tornadic outbreaks of modern times. There were numerous storms most probably supercells and aligned along 3 trough lines. I am certain there were more tornadoes that day and I have hints of such from others I have spoken to about that day. However, I do believe that perhaps what I recall of the mid-80's so to speak and many other years when the northeasters were more active flowing into storms. In recent years like I said the last 10 years or so there have been few if any that I have seen around here - Schofields that displayed such behaviour. 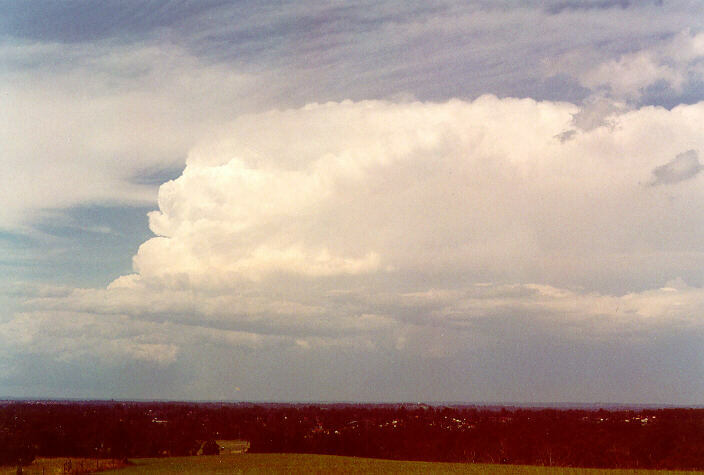 In fact this brings me back to a time when I recall a "bank of storms" as it was described then developing near Lithgow (this had to be before 1989 ie before severe warning system was introduced). I recall an immensely dark base system developing over the Blue Mtns to our west and the inflow - wow I get excited even thinking about it not knowing the significance back then. The storm was predicted to moving into the Sydney region and the whole works was expected including my favourites the large hailstones. It never made it. It went through Blackheath and headed I take it SE or SSE as it missed Sydney and ended up in the Illawarra region. Another system I recall for those that live out at Orange as one of the most significant events for the country - a massive hailstorm probably a supercell that flattened Orange and its fruit. I recall the storm was a long way away but the outflow was strong even here once it moved towards the north of Sydney. I recall a lecturer at Uni suggesting it reminded him of the Brisbane storms he used to remember when he lived there with a massive anvil. Now this is the sort of power you need for tornadic activity. Now Anthony, you did suggest that Victoria and southern NSW is a place for classic supercells but I tend to agree the inland NSW and Qld also can mix it in earlier in the season. I think the setup is very similar on certain days with good windshear. If you look at the Bureau database, it seems northern NSW tends to be a part of the tornado alley. I would say anywhere in the wheat sheep belt has the ideal climate for such conditions. However, the last few years has not seen the most ideal conditions for storms in those areas. And of course, that goes for SWA and SA as well though perhaps more specific to times when moisture is available so not as often. Ummm not all in agreement with this point except that if it is too moist then you are in my opinion less likely to get supercells but yest this means that you don;t always have the ideal setup for supercells. I nowadays seldom chase with moist air aloft. I suppose it is relative and more related to chasing the coast so to speak but I can agree with you on the recent "supposed to be a good chase" day in the upper Hunter. Please understand that northern Texas Dallas is at Sydney's latitude and the temperature profile was not really that incredibile when I last checked and they were expected possible tornadoes well a watch issued so there was that chance based on the lapse rates and so on. But you are correct when comparing to say Tamworth etc. Perhaps Kansas is about Tasmania so that is where the difference occurs. It is Oklahoma that is recognised as the state with the most severe weather major tornadoes and hailstorms and that is in line with SNSW and Victoria. But really I think trying to compare in this case is not as important unless considering the so called jet and polar jets. But I don't think it has an overwhelming bearing with tornadoes and no tornadoes as once you get an outbreak of supercells, providing you have the correct conditions such as shear then you can get a tornado outbreak. Remember that the September 29th outbreak occurred in central to northern NSW. Remember that significant tornadoes can occur well up north into Qld territory. But as Anthony pointed out, Victoria is a prime area as that is closer to where the polar jet it most active. However, don't forget the subtropical jet over NNSW and SE Qld or those latitudes over other parts of Australia. I feel the Victorian example is more related to the dynamic early spring weather type outbreaks ie faster moving supercell and the northern NSW are the slower moving system late spring early summer type of outbreak even though that can happen in Victoria late January in some years. Agreed though I will see when I get there how it compares to what we have seen. It is interesting to note that some US chasers are looking at the web pages here and ask the question why we don't get the massive tornadoes with them. hmmmmm the whole essence of this discussion. use of radar behaviour, left and right moving properties and also the angle of veering based on the predicted mean level wind profiles and also whether the storms increased or decreased in velocity. I think a combination of such items had to be included if they were to be satisfied as a supercell and they plotted helicity against CAPE and compared. Of course the US example, they used a study done on 400 major tornadic supercells. Now the point I am bringing out is the need to use radar as a means to pick out significant supercells. I find this annoying as it means the hole created in northern NSW and I suppose major areas of SE Qld is incredible. So I can only see unfortunately a biased result overall but I suppose it was an attempt. Now further to this if I recall correctly, they were going to use case studies that were around since reliable radar was introduced. I just thought I would bring this point out. Again, please don't quote me on these points. >>The point about supercell research being mostly based on the US >>experience >>is valid. I do personally believe we have a slightly different >>animal. I agree Michael and I suppose this argument could be used anywhere in the world. I think the US is quite unique in that it seems so ideally located and geographically configured for 'the' animal. To me Australia is not, and I'm not sure thatwe have a severe storm 'set -up' any better than South America or even Africa. I believe we have a less ideal setup than China, and other parts of Asia (Bangladesh for example). Based on the efforts of chasers over the last several years, in my view it is quite telling that no supercells with rapidly rotating wall clouds, or even the dramatic base structure which is the hallmark of the US storms, have been caught on video. We get giant hail, we get 100+ mph straight line winds and monster 18+ km high storms. But we seem to get very few storms that exhibit strong rotation at the lower levels, something that I believe will be confirmed over the coming years. It is still early days as far as Australian chasing goes, but my suspicion is that the prime areas have been well covered by chasers now. I know great storms will continue to be caught on video although i think the tornadoes will continue to be few and far between. In comparison to the US, I think it is quite obvious that they get more supercells than Australia and many more tornadic supercells. Based on my armchair observations over the last few years, a typical spring period in the US sees instability persisting over much broader areas than Australia, is more extreme and of course both speed and dierctional windshear is much better. Still we get our fair share and as a storm chaser rather than a tornado chaser, I for one am not dissapointed with what we get! That is exactly what I am saying..to an extent. It does inhibit supercell formation, how ever there are conditions when CAPE's are so high that like lack of shear the moist middle layer problem is overcome through shear energy. I suppose I look at the USA pics and see a supercell with nothing else around it, no junk cloud. Yet I look at Australian supercells ( except for the dry line variety ) and see junk cloud everywhere. I suppose I should add that Dallas has landmass to its north, not an ocean, but again this is stating the obvious. This comment about the US chasers asking the big question does not worry me. I have never thought our tornado frequency was anywhere near as high as the mid west, in threads long ago on this list I remember people suggesting it was . The simple fact is it is not. I pretty much agree with what you say about hail frequency and supercell frequency, yet tornadoes are down, therefore something is missing. I think the low level jet theory fits the bill perfectly. Just a couple more points. Firstly, I do not believe that any conclusive evidence exists that there is any dynamical difference between US supercells and Australian ones (other than the change of hemisphere). 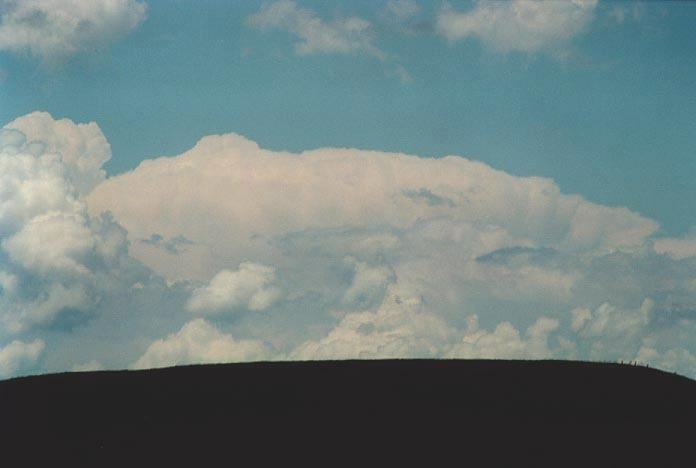 A supercell is a mode of convection that is the result of a variety of environmental factors. It does not appear to make any difference how these influences are brought together synoptically. In the great plains of the US, for a variety of reasons, these influences are in place more often than anywhere else. But despite a heck of a lot of research and observation, don't be too confident that even in the US they know all there is to know about supercell and tornado dynamics, and so comparing them to ours, which we know even less about, is a bit of a stab in the dark. Neither do I think you can say with any level of confidence at all that a smaller fraction of our supercells are tornadic. As an example, you only have to look at April 6 this year on the US plains. A strong surface low, rich boundary layer moisture in the warm sector with strong convergence about the cold front and dry line, vigorous mid-level short wave overlain by a strong upper jet all combined to give classic major outbreak conditions, with very steep lapse rates approaching dry adiabatic to 500 hPa, surface based CAPEs of 2500-3000, moderate low level capping, with good low-level and deep layer shear with SRH in the 300-500. I'm sure I just made a few mouths water - but the result? A grand total of 2 brief, weak tornadoes. Plenty of large hail and wind damage reports, but virtually no tornadoes, and certainly no significant ones. What happened? The same thing that often happens, even over there. Supercells, but no low level rotation, and no tornadoes. Why did it happen (or not happen) - no one knows. Studies of Australian supercells are in their infancy it is true. But an important factor to understand here is that even in the US, only a SMALL minority of supercells are tornadic. This cannot be emphasised enough. Figures are hard to give with any certainty, but it is probably somewhere near 20%. Low level rotation cannot be considered as a benchmark of US supercells, or anything of the sort, as the majority of them simply do not have it. Do not be overly influenced by graphic pictures of big outbreak days. You do not see anything from the majority of days when the supercells do not produce anything other than large hail or damaging straight line winds (or nothing at all) - for example April 6 (this is quite a spectacular failure case, but there are countless less eyeopening ones every year)! One other thing to remember is that quite a large fraction of initial tornado reports in the US (which are later placed in the US tornado data set) do not come from chasers, or even registered spotters. They come from locals - policemen, shopkeepers, teachers, folk in the street. How many of those would be reported in Australia? A hell of a lot fewer, because a) there are way way less streets for people to be in, and b) a much smaller proportion of people would know a tornado if they fell over one, or would recogonise the importance of reporting it even if they did. With the vast majority of our (comparitively) miniscule population living on the coastal strip where a larger proportion of HP supercells with poor visibility and poor viewing conditions could be expected, the situation is even worse. I'm curious about this last statment as high shear generally requires high CAPE so the sotorms can stand up against them without being decapitated? I thoroughly agree with your comments and my personal opinon/gutt feeling is that the dynamics are very much the same, just the boundary conditions to the problem change with location, so it seems sensible that your not going to get the same result. outbreak conditions, with very steep lapse rates approaching dry adiabatic to 500 hPa, surface based CAPEs of 2500-3000, moderate low level capping, with good low-level and deep layer shear with SRH in the 300-500. I'm sure I just made a few mouths water - but the result? A grand total of 2 brief, weak tornadoes. Plenty of large hail and wind damage reports, but virtually no tornadoes, and certainly no significant ones. What happened? The same thing that often happens, even over there. Supercells, but no low level rotation, and no tornadoes. Why did it happen (or not happen) - no one knows. Anthony that graph you have described is important but in a discussion with Paul Graham, we decided that some of the more violent tornadoes tend to occur in a group with high SRH and high CAPE at the same time. I know that it would potentially be a massive complex. I think this may have been the case in Oklahoma City May 3 outbreak from observation of the satpic animation for the day. What do others think? Your thoughts are exactly what I am thinking about that we simply do not know. We have only covered a small proportion of our countryside over a two year period really. And usually when you want to be out there, you can't!!! Now the argument is not about chasing but I do believe that video and photographic evidence is more effective to help identify and also help educate others in identifying wall clouds, funnels and tornadoes as we see them rather than apply the typical model we see in the US documentaries where you tend to see text book cases, and often the footage you see are repeated time and time again in documentaries giving the impression of more violent tornadoes than actually occurs. One question before I proceed: have the US chasers and researchers talked about Australian conditions? I mean have they been able to compare US satellite picture based data with supercell outbreaks here and even suspect probable tornadic activity? I am just curious as there may be patterns where one probably can with a high degree of certainty suspect tornadic activity.. However, I do believe that since conditions come together more often, then the US do have more tornadoes and therefore a larger proportion of larger ones. However, it seems the regularity of the conditions tends to occur April to June. Our storm season, like others of course, seems to be able to start from August and spread all the way to April in most years. We do not have a prescribed season. Further, there was an argument put forward about the continental land mass allowing for cold air to come southwards with larger temperature differences but these tend to be more important and more frequent earlier in the season. As Jonty suggests, the synoptic conditions is not far fetched from Australia considering out latitude. I think the late spring/early summer season tends to be more aligned with similar profiles to what we enjoy here. Again the lower level jet is the key factor in my opinion that we have lacked in storms we have chased. I think the answer will not come thoroughly from storm chasing alone but by improvements in remote sensing from satellites. Determining the wind flow at the surface and teaming up with observers/storm chasers is a very important project that I would like to be part of. It may help verify what conditions have occurred when we get more explosive environments - particularly when tornadic supercells are observed and perhaps compare to the US. Unfortunately, we do not have the "needs" for such research to take place but you never know if the US researchers may want to team up with Australian researchers to help improve global models on finer grid scale. Anyway, I think it is an exciting time ahead. Given that (IMO), these are one of the two most major factors - you'd require both to be present in large quantities to produce the "perfect" conditions. If they both contribute to tornado liklihood, then you'd expect both ingredients if present in large quantities to contribute to larger/more violent tornadoes. Ultimately the trade-off 'effect' would tend to produce smaller/weaker/shorter lived tornadoes - but this is not always the case, which I guess throws more fire into the debate of tornadoes and how they form..
Shear in itself can actually create instability. For example, strong diffluent or divergent jets actually cause a lower pressure around them. This is because more air is leaving the jet then enterting that certain area. (An analogy of this is actually something I've observed at Withcott on the Warrego Hwy :) Towards Withcott from Toowoomba, the speed limit drops from 100 to 60, all the cars converge on each other and bunch up as faster cars come from behind and slow down - there's always people waiting near Withcott to join the highway, it's harder for them here because there's lots of cars enterting. Just on the east side if Withcott, the speed limit goes from 60 to 100, the cars first to hit the 100 sign accelerate away from the cars behind them - leaving space for cars to join the highway. Motto of this, you'll save time in busy traffic trying to merge onto the highway on the east side of Withcott heading east :-) But it's the same in jets - with more air leaving the region then enterting it (by region I mean over a small area of space, ie several km/tens of km), this causes a low pressure region and air below it moves upward to replace it. Diffluent jets have a similar effect - just think of lots of cars leaving the highway due to lots of exits, and there's a lot more room for other cars to join. IE - more air is leaving the area then entering it, creating low pressure. So this helps in adding buoyancy to the updraft. In high shear situations, low CAPE could prevail - but the effects of an upper level trough/low and diffluent/divergent shear in the mid-upper levels can assist in "pulling" an updraft (it doesn't really pull though). I think high shear situations tend to be stronger in winter as the jets are lower, so their impact is felt stronger in the lower levels. A strong cold front, or even the convergence zone on the coast due to wind friction (less friction on water than land), helps act as a forcing mechanism. I'm curious about this last statment as high shear generally requires high CAPE so the storms can stand up against them without being decapitated? Might I add another factor which might be hiding the number of Australian tornados [along with low population density, low public knowledge of supercells, bad road networks, not to mention any dynamic atmospheric differences] - might there be a difference in the percentage of aussie supercells that produce highly visible, easily verifyable to a member of the lay public, condensation funnels? 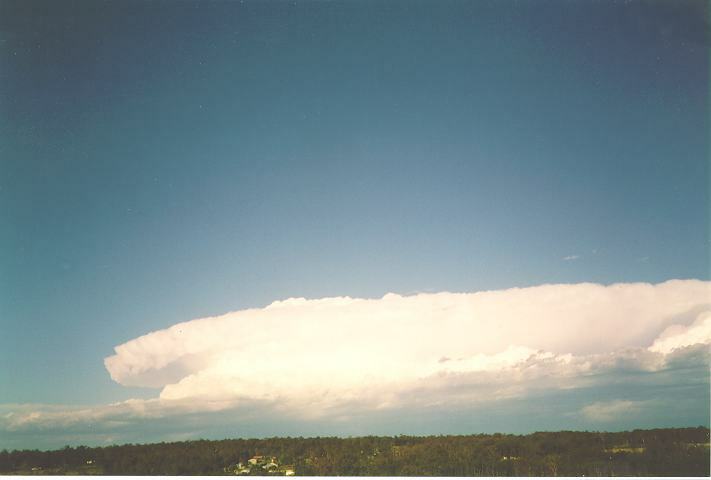 If for some reason [higher condensation levels, less available moisture etc] a large number of aussie vorticies were only visible as a short inverted cone at cloudbase, and a debris swirl if they touched down. Hardly your average wedge that people are familiar with on TV - they might not recognise a twister that was right in front of them for what it was. Might be blowing out of my proverbial, but it was a thought. There certainly is truth in what you say. Most of the tornadoes/possible tornadoes have been observed without the so-called typical text book funnel reaching the ground. Good point made but I suppose time will tell what is observed in the future. The time when I stopped to think about what is observed here as compared to the US is when I saw chasers referring to wall clouds that didn't even look like such. I mean i nice circular base rotating either slightly or rapidly. Well, when I observe small prongs in videos, I found myself reflecting back on my photos only to find very similar examples. 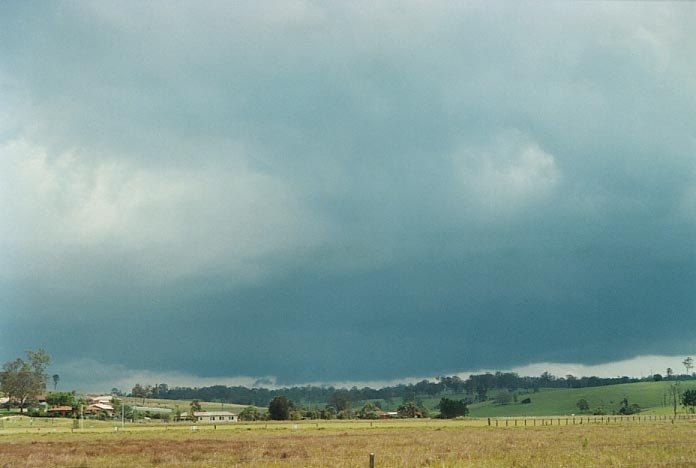 Refer to the wall cloud pics 3/4 way down the page with Riverstone and Rooty Hill listed on the same storm. If you doubt this, I have seen US examples and these were rotating (I think anti-cyclonically but I couldn't be sure) and the storm had a very strong updraught. Now this one would not even qualify in most people's book but it rotated anti-cyclonically and was maintained for over 20 minutes but obviously was never going to do anything. Just a few comments regarding David's email below. Regarding Australia not having as good a severe storm set-up as other countries....well I don't know enough about other countries to comment on this so I'll leave this to those who know. As for the comment re: storms exhibiting strong low level rotation - I am a little inclined to agree to the portion of the statement which suggests we don't see a lot of this in Australia to a certain extent but I will discuss my reasons for this in the next statement. As for the comment that we don't get this strong rotation in the lower levels - I think this comes back to the point which relates to the lack of strong low level winds. One of the main features which we lack in Australia is the strong moisture laden low level winds which help provide that added shear. Yes, the coastal areas get their NE'lys which bring in the moist air but rarely are they travelling at speeds of any consequence. To make a comparison to the US, they often get surface (note the term surface)winds of 25-30knt (if not more) providing food for their hungry storms. This is generated by the strong low pressure systems which park themselves over W and NW states, providing the tight pressure gradient. In Australia (along the E coast to be more specific), NE'lys would normally be as a result of a trough sitting inland and usually this will not be deep enough to generate surface flow of more than 15knts. The few cases in Australia which has seen strong surface flow has resulted in tornadic supercells along the E seaboard (not necesarrily the coast). The three examples I refer to are 1st January 1970 (Buladelah), 4th November 1973 (Brisbane) and 29th September 1996 (NSW). In all three events, a deep surface low was present, promoting the tight pressure gradient and generating the resultant strong low level winds. I may one day get around to doing a more in depth study of events such as these (as I'm sure there are many more examples of these synoptic set-ups) but time is a limiting factor at the moment. As for David's comment regarding the fact that the prime areas of severe storms has been well covered - I disagree with this statement. I don't beleive that the small number of chasers we have here in Australia and the large areas considered "prime" have been covered thoroughly at all. In just the past 12 months there has been many a time where a handful of the chasers have sat and watched massive cells (pure speculation based on radar and satellite observations) from their computers and commented..."geeze I wish I was under that cell" OR "wouldn't it be nice to be in Murwillumbah right now". Unfortunately, many (if not all) chasers are restricted to when and where they chase due to work, family and other committments. The only times when a majority of the storms on the E seaboard are watched closely is when the Thunder Down Under crew is out and about. It is this 3 week period when you can (almost) safely say the chasers are likely, on any given day, to be in the area which would be "prime" for that day's storms. Yes, there are still times when distance and other factors (such as floods) can restrict where we chase on these trips and becuase of this events will be missed. This was the case on the Thunder Down Under trip in late November 2000. On the 22nd of November, we chased between Emerald and Alpha (a few hundred km W of Rockhampton) and saw some awesome storms. On the 23rd we had a dilema as heavy rains earlier in the month had cut a few roads further W but the trough which had help kick off the storms from the previous day was expected to retreat inland. With a strong jet aloft and high dew points (into the mid 20's) so far inland we were very tempted to head out even further W and chase in the Longreach area with the chance of some severe storms for the next few days. On the other hand we had to consider the chance of being stranded in Longreach if more rain was to further increase water in the already flooded area and also the fact that we may put ourselves a long way out of the way for the next system which was forecast to come through in 4 more days in S NSW. Unfortunately, we decided not to risk being stranded and never headed out towards Longreach, yet on the 24th of November, the Bureau of Meteorology recieved a report of "large funnel shaped cloud on the ground" (ie tornado) just 35km SW of Longreach. Now i'm not saying that we would've seen this - this is not my point. My point is, is that chasers cannot be everywhere where it is primed for big storms. Another example of this can be seen by looking at the last 16 months in Victoria. There have been at least 8 confirmed tornadoes here of which only 1 was seen by a chaser, yet on all except one of the days when a tornado was reported, several chasers were out in the field. At the end of the last Victorian ASWA meeting, I had a brief chat with Harald Richter about the differences of chasing in Australia and the US and one thing which has stuck in my mind was the comment that in Australia, a lot of chasing is based on luck. I cannot emphasise enough how true I think this is. Given our limited weather data resources and access to real-time weather information whilst out in the field on top of the topography and road network in Australia, it is amazing how much luck comes into play. When you think that the avergae tornado lasts less than 10 minutes, the probability of being in the right place and the right time and under the right storm is amazingly minute. Given the lack of understanding in how one storm becomes tornadic over another, it is amazing that chasers ANYWHERE (whether it be in the US, Germany, Australia or New Zealand or anywhere else) see tornadoes. How do they do this? They do this by reducing the luck factor. They look at what limited information they may have and they position themselves in the area which, given the current understanding of severe storms, is most likely to have the most severe storms on a particular day. They also position themselves near/under the biggest or most intense thunderstorm chaseable in that particular area. Not only this, they position themselves on the side of the storm which is most likely to produce a tornado. Immediately they are giving themselves a better chance at seeing a tornado than someone who is sitting on the wrong side of the dryline/trough line or someone sitting at home in their loungeroom. The more often they do this, the more the probablility increases that they will see a tornado. They have siginifcantly reduced the "luck" factor almost to the extent where IF the storm does produce a tornado, they will see it. It comes down to the individual storm. I guess what I am trying to say is that given the circumstances facing chasers in Australia, I think we are doing an excellent job in increasing our chances of seeing tornadoes (and other severe weather associated with thunderstorms). And in the process of doing this, also increasing the awareness of both the Bureau of Meteorology and the general public of the frequency of severe storms in Australia, ultimately in the hope that it will benefit these people (being the public) in the long term. Enough from me. Terribly sorry if anyone get's in trouble for falling asleep at the computer. All valid points have been discussed here so far but I'd like to keep this particular email restricted to just 1 comment made by Jimmy. Note this email contains some humor as well as a serious aspect. Quote "Unfortunately, we do not have the "needs" for such research to take place"
I think the "need" will come from an initial trigger. Unfortunately this trigger, as we have seen in the past, will have to be a significant event and in this case it WILL be by a strong tornado (actually....a tornado that takes several lives) passing through a populated area (most likely a captial city). There will then be 2 main driving forces behind the push for more in-depth research and that will be the general public and the insurance companies (and a 3rd if you include us storm chasers....hehe). It will then come down to the government (which I hope Anthony Cornelius is the Prime Minister of Australia by then so he can just give us an open cheque book to work with) and then we'll all be paid to chase 24/7 for 52 weeks a year (who needs holidays if you can chase chase chase....). But you can see what I'm getting at here in that the government will not see the need for such funds to be given to the BoM until an unfortuante event takes place. Some good points made by Andrew. I particularly agree with the fact that the only time we serious chase as a group without time and distance boundaries is on the thunder downunder annual meets. Last years TDU2K was great, but was the weather pattern anything unusual. In fact it was pretty settled and marginal on many days. I cannot wait until TDU chase hits a major system like the ones Andrew describes. TDU in its years has yet to hit some areas like Gympie and the area, and we all know that area can go off with tornadoes. I just can't wait until we get to those areas. Another point that David mentioned is that most of us chase just to experience good storms. For me a bust is when I put down serious kilometres and do not see lightning. Even a pissy pulse storm with 2 bolts and 0.2mm of rain is NOT a bust. I am happy just to get that. Hail, downbursts, massive gusters make a great chase. A tornado would be nice, but if that was my sole goal, well I am in the wrong business. I think you have raised an interesting point here Phil. I have spoken to people in the past of classifying eastern states thunderstorms into two completely separate categories (yet as usual there are exceptions to these and combinations of the two). The first category being the "coastal storms" where the storms usually breed on the ranges and then move off the ranges to affect coastal areas. Due to their proximity to the coast, these storms breed in mositure laden environments with surface dewpoints consistently hitting 20C and above, yet surface temperatures in these conditions rarely exceeds 33C. This mositure will often give these "coastal storms" the low based, HP appearance and in the case of a funnel forming, you would expect the condensation level to be at such a point where a significant portion of the funnel is visible (if not engulfed in rain). The second category is the "inland storms" where the storms breed W of the ranges in air which is regularly significantly drier than that of the coastal areas. Dewpoints in the 12-18C range are far more likely and surface temperatures are more likely to be in the 35-38C range, giving these "inland storms" the higher base and in the case of a funnel forming the higher condensation level would lead to the expectation that the condensation funnel would be only partly visibile (if at all). I know there is the factor that high-based storms can have locally lowered LCL's but given a general situation you would still expect the LCL to be lower in these conditions than in the circumstances of the "coastal storms" situation. Its an interesting question to pose. Perhaps another point to keep an eye on in future chases/observations. Yep I agree, I too can't wait to roam the Australian country looking for storms on the next national chase,same with me even a distant anvil makes me very happy especially when its not supposed to be there. I have always said ..its only a matter of time before we get on the back end of an F3 and all our dreams will be answered,but if your like me one wont be enough!. I think i misundersttod your initial statment as you were clearly siting that a large SRH can produce tornadic supercells with small CAPE, so long as the CAPE is above a certain level. But i interpretted it as a 'proportional argument' such that, at the extreme, very large SRH with zero CAPE could produce a tornado - clearly not. As a clarity note, when you talk about 'instability' and 'bouyancy' due to diffluence aloft and convergence zones, i know you realise this is dynamic modes rather than thermodynamic but for other people reading this message, it should be noted that these are two different forcings producing a similar effect. Thanks for an excellent post Jonty. Of course my presumptions might well be borne out of impatience! I know Australia can produce some very serious severe weather: strong tornadoes in 1989 and strong / violent in 1992. [ I am particularly curious about November 1992 since F3 and F4 tornadoes where reported in Qld and a monster of unknown intensity photographed near Adelaide - perhaps these were even part of the same system? ]. Add to this Sept 1996 - a day when major tornadoes may have evaded watchful eyes, and clearly we get some very impressive stuff. However I have yet to see any Australian system (since the inception of this list at least) which would 'seem' capable of having that much clout, though I realise a single tornadic supercell need not be restricted to such obvious potent large scale weather systems. As a consequence though, I do often wonder how rare are these storm systems and their progeny are in Australia? I do think it is fair to say that the US is considerably 'stormier' than Australia, both taken as a whole. A casual glance at the historical lightning data of both countries would seem to indicate this. Following on from this, I think it is fairly reasonable to assume that, with generally much more dynamic wind fields, that supercell numbers would, therefore, be higher in the US. I tend to disagree with those who suggest that we get supercells in numbers comparable to the USA. Your are quite right in that my assumption on Australia seeing a lower proportion of tornadic supercells is nothing more than a guess - there is nothing to suggest that this is or indeed isn't the case. It really comes down to my own personal 'gut-feeling' and so has little in the way of any objective reality. A few things led me to this gut feeling though. Outside of the tropics, central eastern Australia, appears to be the most storm active (again judging from the lightning maps and also more intensive observations over the last few years). This area I feel can 'cut it' with the eastern US in terms of severe storm frequency. My feeling is that if it doesn't happen often here (as the last few seasons would seem to indicate) then it wont be happening too often elsewhere (Booleroo is an example that it can and does happen - just not all that often). Since these areas have been well quite well chased in recent years, and given that the population density is not all that low in the broad area I am thinking of, I really am suprised that nothing significant (tornado or decent rotating wall cloud) has been bagged by this stage. Like the eastern US, particularly the southern areas, there would seem a relative abundance of HP supercells - correct me if I am wrong but I have thought that this 'end of the spectrum' tends to develop in high CAPE and 'not ideal' shear conditions >> less tornadoes, particularly the stronger or longer lived variety. Again you and some others on the list are much better qualified than me to draw these conclusions, this is simply based on my own observations and the limited data available. All in all it is fascinating subject and kind of frustrating in that it is limited to much speculation - what really goes on in our backyard. Of course it is hard to imagine the BoM getting government funding for any reasonable study, at least, as Macca stated, in the absence of a major tornado disaster. I suppose our best chance is if the US researchers took an interest in our supercells in a comparative sense. Our geography / topography / climate is very different and yet we do still produce these monster storms year in year out - how frequently with or without tornadoes is the question. David, I again cannot emphasise strongly enough that we have only touched the surface in chasing storms the last couple of years. Perhaps we have done more in this season than the previous and we shall continue to do so. Surely we have gone right around northern NSW and SE Qld, Victoria and also Adelaide region and SWA. But because of distances and work commitments as Andrew has suggested, we have not been able to chase on the days we really would have liked. And like I said, when someone chases and gets a tornado of significance, I can tell you that it would represent a significant find. In other words, getting an F3 here would be like chasing and getting an F5 in the US and just as significant in my books. To me, a storm that produces an F3 is very significant as I have seen storms producing F5' in the US with a variety of damage paths varying usually from F3 to F5 along its most damaging paths. Even if you are bored with my rambling on, please look. I know it is wishful thinking, but I still maintain what we would see if someone got a bulldozer and opened up a 5km grid road network throughout the inland and we chased more regularly. I really feel it is a matter of time so be patient. Anyway, I have things to do and keep rambling on... Keep this thread going. One of the points you raised was one of the angles I was coming at in regards to the type of supercells we get here in Australia. They tend to be orientated more towards HP (typical of high CAPE, low shear situations). In the US, a warm dry layer exists at around 850mb, and that rarely happens here - normally it's moist, and not much warmer. Sometimes it does exist, but rarely when there is an upper level trough above it. Rather, we get what I call high CAPe days (cap and CAPE), often combining with a strong upper level ridge, that crushes the hope of the mightiest of the Cu Hu (or even at times CJ's) of ever getting started in such an environment. I agree that HP cells tend to produce less tornadoes than classics, I think a study has been conducted on this before in the US? One of the main reasons being that the precipitation and outflow of the storm tends to frequently get caught up in the mesocyclone, suffocating it. HP supercells also though make it much harder for people to see tornadoes, as they seem to frequently be rain wrapped! The other thing I find interesting is the term "cyclical supercell" - which I have often wondered exactly what it means. But I've assumed it to be a supercell that continually cycles through stronger and weaker mesocyclonic phases, during each phase producing another tornado. If this was the case, you would also expect that HP supercells would be less likely to exhibit this type of pattern. The other thing, is I believe what a lot of people in Australia often scoff at (the "cold air tornado"), actually occurs in the US a fair bit during winter/early spring - and are classified as "proper" supercellular tornadoes. Many people don't chase on these days as the storms move too fast (I think in March a tornado was moving at 90-100mph in the US!?) A lot of "cold air tornadoes" would move very swiftly too. To briefly swap over and reply to Jimmy's email - I agree that the weather over the past 20 or so years has certainly appeared to be more tame than say in the 1920's and 30's! It's difficult to tell though, but I would argue that the storm reports in the 20's and 30's are more detailed, and more actually exist than in the 90's and 00's! (For QLD anyway). I remember typing up some severe t'storm records, and the reports were phenomenal...cars bonnets being peirced by hail, hail drifts that froze cattle to death in summer (some up to 6ft deep!) There are other reports of houses and farms being completely destroyed...one referred to one half of the street being undamaged, and the other half a street difficult to tell farmhouses had existed there! Certainly some interesting stuff. Australia's most expensive tornado was the Brisbane Nov '73 tornado...and it brings up another issue. In the US, tornadoes are rated by the highest single damage they do to a house. In Australia, they tend to be averaged out. The '73 tornado was rated an F2 - but I think it's commonly believed an F3 rating is more appropriate (and I have heard rumours that the BoM would reclassify this as an F3?) Yet interestingly, F4 damage was also reported from this tornado! I think that again it comes down to population density...rarely does a major tornado ever hit a major city in the US, and given that there are even less major cities in Australia - the probability would be even less. In the 30's (I think...) there is a report of a tornado that went through south Brisbane for 30 minutes, and it "destroyed houses," so this is also interesting. It really is a great subject! I've been enjoying this thread immensely, impatiently waiting for some one else to write about it :-) As DC has said - it's subject to a lot of speculation due to the large data gaps that are present when you compare the two areas. Banana wall cloud (Banana was the closest township that would have been demolished had a tornado formed, and is in QLD) bagged by TDU chasers last year, of which all who attended would have photos. This wall cloud and funnel reached over 1/2 way to the ground, no time to stop and see what was really happening, and also tree's were a big problem and we could not see the ground underneath, also on TDU last year. This speaks for itself Nov3 last year. that is just from a quick flick through ASW. And the wall cloud on the front of Storm News issue 4 is one of the best I have seen for Australia, always drool at it when i look ! The next couple of years will be very interesting, and after time it will pay off for the people that are out in the field making the effort... it comes down to the old saying "you wont see anything sitting at home". Just a quick note on the point 'Sydney should ahve been hit by now', a recent speaker here showed a diagram of the return interval for torndaos in the US - the shortest interval for any one spot was 2000 years - that's no typo. I'm not sure what grid size they were analysing on but it must have been small. Either way, it gives an indication on how infrequent it is for a tornado to strike the sample place twice in any human scale length of time. I think to presume Australia gets any where near the number of events as the US would be foolish, regardless of any point of 'population density' or 'doppler radar' arguments. We simply don't have the georgraphic setup to produce those frequent high CAPE days, which, as Anothony was noting in another post, can make up for a lack of any dynamic effects. Hence, I agree with Jimmy's quote that an "F3 (oz) is as significant as an F5 (US)". Just to add another thought to this popular thread, and it is a subject I have previously mentioned on this list in the past. There is some debate as to whether the coriolis force plays a part in inducing or maintaining rotation in a mesocyclone system. If so (and it IS very debateable), then in the Southern hemisphere you would expect the coriolis force to act on rotation such as to weaken a northward moving storm, and to strengthen a southward moving storm (for the same reason that a cyclone cannnot cross the equator). It is a singular fact that by far the vast majority of US tornado tracks run in parallel from SW to NE, no matter what latitude throughout the entire US. Therefore it can safely be assumed that the parent supercells are also moving SW to NE. Thus, while there are no doubt a great many supercell thunderstorms in the US, it appears that only those on a SW to NE track generally produce tornadoes, with only a very few exceptions. Inverting this to the Southern Hemisphere, you would perhaps expect then a similar situation would prevail, i.e., a requirement for tornadic supercells to be on a NW to SE track. While I have seen a great many supercell thunderstorms in Australia, very few have been on this track, with most storms being on a SW to NE track, i.e., perpendicular to the preferred direction. And some almost a S to N track (Sydney hailstorm for example, and Gold Coast storms just last week - using the Coriolis theory, none of these storms had much chance of producing a tornado). But... maybe the coriolis force has sweet FA to do with it, and it is all a question of prevailing winds, shear, helicity aloft, CAPE, etc.. In which case it just so happens that the circumstances which give rise to tornadic supercells in the US also happens to be the same circumstances which move those storms SW to NE. And perhaps latitude does have something to do with it, with storm movement tending to prefer a clockwise shift in directional vector as you move South in the Southern hemisphere (along with frontal boundaries of winter time lows). With the majority of Australia lying further equatorward than most of the US, that "might" explain the preferred storm direction. (But lets not get confused with frontal storms and associated 'coldies', lets stick to Supercells). I wonder if there has been any attempt made yet to gather all known tornado tracks on a single map of Australia. I wonder if the data is even available, it sure would be an extremely interesting addition to the ASWA web site. I hope to do this once I have a significant amount of tornado data in the tornadic events archive I have built on SSC. Once I feel there is enough to do such a map, I will do one, which has been the aim all along of this archive, to eventually plot the places where tornadoes have occured, and tracks if possible, and see if there are any "hotspots" we do not know about. The extremely limiting factor is the lack of Australian tornadic reports publically available. The only place that would have this is obviously the Bureau, and the odd media report Ben Quinn stumbles across from old channel 7 storm stories. I will again ask if anyone has any information about tornadic events in VIC/NSW/QLD to please email me, it would be most appreciated. I tend to agree with you on this one. I feel that you should find that the average of the all the winds forcing a SE movement (or lets say ESE movement for a left mover) is easier to attract IDEAL lower level wind shear than systems forced to move NE. I can tell you this summer has had very little in that regards. I also think this is the reason that 17th January 2001 did not produce tornadoes as it was well chased. I hoped for tornadoes and I know it was possible but I did not really hang as much hope on it. Of course it is easier to say after the event. What I am trying to say, the excitement for me what have been far greater to see a NW jet and then NE winds feeding. I feel too many people are always looking for greatest wind shear possible. But you must be careful. In forecasting, well I try to model in my mind what is going to happen at the various levels in the atmosphere (yes based on the models satpics etc) Assuming the models have been reasonable, you also try and visualise what the storms will do - create a good flanking line, what would happen if it moves left etc. Mario can tell you what I mean. What I can say about this season is besides a couple of days, the lower level winds have not really fallen into line with what I would say putting a smile on my face. Of course one cannot really predict what happens but you give it a try. Having said this, I find it remarkable that people with all their various techniques are out there and tend to end up in the same areas!!!! Fascinating. In my opinion this is turning into the most interesting thread weve had on this list for almost years!!! Keep it up. Now in response to Lyle's email. Its an interesting point re: the return interval for tornadoes. I know of several US towns (and I don't mean city sized ones) that have been hit by a tornado more than once. Of more interest though is the town of Milawa in North Eastern Victoria (Australia) which has a population of just 270 people. This town has been directly hit by 3 (yes three) tornadoes in the past 50 years, with the most recent one being on 9th September 2000. Further to this, the 2nd tornado was reported as having a damage path of 1km wide (i think it was in the early 70's) and significant damage was done to the well known Brown Brothers winery which is located on the outskirts of the town. A second factor to consider is the historical data of towns in NE NSW, of which nearly every single town in that area has had at least 1 tornado reported (time frame and reliability of this report is a little sketchy). As for the frequency of high CAPE days, I will leave that for someone else to answer (anthony) unless it hasn't been answered. Then I'll throw in my two bob's worth on that bit too. As for tornadoes in landfalling cyclones......well....I've always wanted to do a TC chase!!!! BRING IT ON I SAY!!!!!!!!!!!! This is a very interesting point. I'm far from an expert on this coriolis business and will steer clear from it for now. I can just provide some relevant examples of NW-SE moving severe (tornadic) storms (in Victoria). The second event I have bugger all information on except I think it is one of the longest tornado tracks in Australian history and I'm pretty sure it tracked NW - SE as well. It was in South Western Victoria and I think it is termed the "Casterton" tornado. My memory isn't serving me well this evening but a figure of 76km is popping in to my mind regarding the track and F3 rating also pops into mind. I have a feeling the book Cockeyed Bobs and Willie Willies has information on it and I also think Clyve or Lindsay Smail may be able to provide some more accurate information on it. I also have a little feeling that another tornado (which struck the outskirts of Geelong in the early 90's???) may've also had a NE-SW track. Again I think the Geelong locals may be able to fill in the large gaps I have left in this. This could be something to look in to. Considering the Schofields/Riverstone area, it has had 2 tornadoes in the database - 1965 in Schofields and 1984 in Schofields/Riverstone that I experienced though never saw, and I think from what I have heard from 1965 and observed in the 1984 damage, they were pretty significant tornadoes - say more like F2 (certainly not the pissy F0's - F1's). Now the possible path width is about 4km for these two suburbs. Now this is interesting. This area finds it difficult to score direct hits from severe storms though these significant events. Occasionally, it surprises me. Riverstone though from experience is more prone to severe storms overall and that is no exaggeration. The Bureau had tried to argue against myself and also Don White that there were no scientific reasoning to support these observations. I was even told once that it was an optical illusion in my observations.Yerrr right. I think you will all be surprised. They are well worth a look at. Shane reads this group so you can probably share with the group any replies. Looks like a light precip curtain infront of the funnel, and possibly a dry slot on the right hand side wrapping around. The Casterton storm of 1st July 1989 spawned a tornado that was rated F3 at one point along its path, with most damage being consistent with an F2 rating. This main track measured approx 70km & ran NW - SE from just west of Poolaijelo to near Paschendale (near Casterton which is NE of Mt Gambier). There appeared to have been more than 1 tornado. Forcing mechanisms of this storm were (per the BoM preliminary report): i) the storm was initiated on the leading edge of the upper cold pool under a marked diffluent pattern with split jet structure. ii) low level forcing played a role in initiating convection. A squall line developed with several larger embedded cells in the line. The line of storms moved east at ~40kmh, whilst individual cells within the line moved SE at ~60kmh. 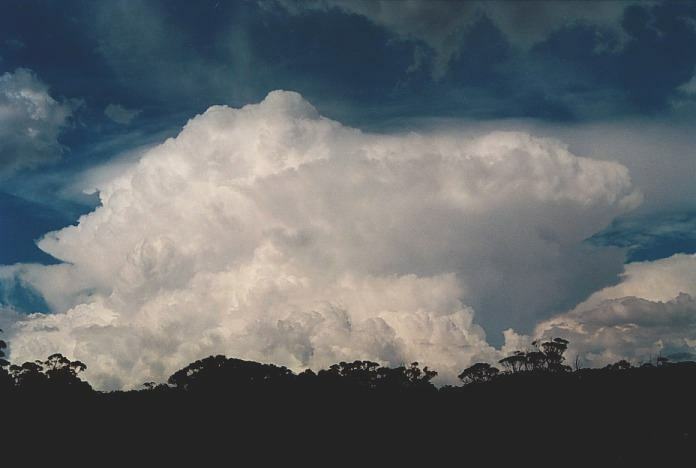 The Halls Gap storm of 27th January 1997 (in western Victoria) also moved southeastwards, dropping cricket ball sized hail & a tornado which briefly touched down into Lake Fyans. I think the generally accepted source of vorticity is the tiliting from the horizontal to vertical in strong systems, the mechansims of which are debatable. There is also the notion of surface convergence to 'spin-up' but this can only account for week circulations - there simply isn't enough vertical vorticty on the surface to explain the magnitude of the winds that develop - note that land spouts (can be combintation of both forcings), dust devils etc are primarily forced by surface convergence - hence their weekness. Reveiewing some modelling studies, the effect of CF in simulations is not that strong but definatly evident - it produces the 'bowing' in squall lines and can give preference to the right mover but more dynamical forces seem to be at play. I guess an interesting analogy is the bath tub. Common misconceptions are that toilets and bath tubs will circulate in opposite directions in the different hemispheres but this is not true - sort of. the ciruclation is *mostly* forced by the geometry but, given a very still bath tub and you remove the plug without disturbing the water, it will rotate cyclonically. Why - because it's an unstable equilibrium and the very weak coriollis force that develops can cause the fluid to veer into the cyclonic direction. This was done in Labs. However, if you put your finger in and spin up the water anti-cyclonically, it will merily go that way. Whats my point? That the intial conditions and boundaries are very important but, left to it's own devices, the CF can push the balance. Is this why mesocyclones circulate cyclonically? - hey i'm not going that far, but it's worth thinking about. I must say that over the last year i have learn't a little bit about the fundamentals of severe storms but have very little working knowledge - i hope to change that by the end fo this chasing season! But, from what i know of devlopment in the states, the situations that will produce an outbreak (a prime chase day) is a negativly tiling trough or just a good jet aloft. That translates to a mean flow direction that runs SW-NE, hence so do storms and, thus, their tracks. I imagine this must be similar to Aus. As a side note to Anthony, I was showing a collegue your photo's who was very impressed. Curious, was that big arcus cloud done with a 17mm? G'day Matt, Anthony and others. This is a great thread and I have certainly learned alot from all the posts! When I mean significant I am making a comparison between what I have seen here (my own eyes or others videos) to what I have seen in the US - of course this is not really a fair comparison for the number of reasons which i wont re-iterate. Rest assured I have read every single Australian chase report that is online and have enjoyed every single one - some amazing storms have been bagged. Please dont think I am scoffing at the Australian events. For me it is all about comparison - not competition. It is all part of the one global puzzle. . 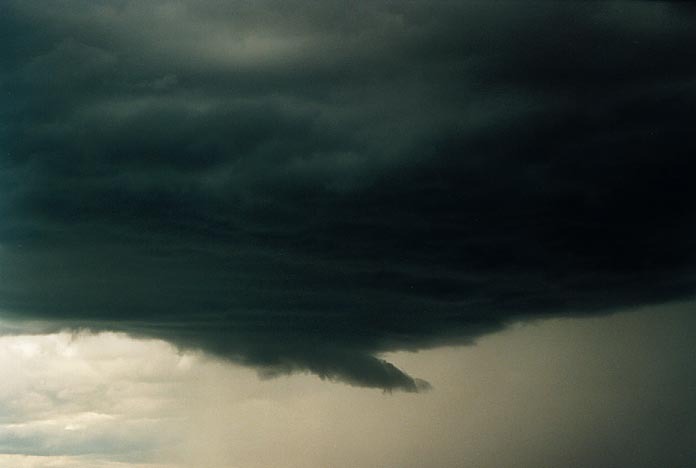 But in my opinion, the only piece of Australian video which comes close to the kind of wallcloud 'appearance' I am thinking of, is video by yourself and Con Bitis of the 3/11/00 Sydney supercell. MT's 03/97 Shelharbour pics would indicate something similarly impressive - where was your camcorder Michael :-(. Other than these, relatively few Australian wall clouds have caught my attention. Jimmy's Oberon and Woolgoolga ones + a few others from other states look very good although rotation is impossible to make out in every case. In the US the chaser motto is along the lines "stay on the southwest side and you'll be fine". In Australia, I believe storm chasing will almost always be more fruitful if you stay on the NE as opposed to northwest side of a storm - not for tornadoes but for photogenic shelf clouds, dark bases, lightning, and of course updrafts. On the banana wall cloud, to be honest, and as I have told Jimmy, it did not impress me as a wallcloud. Of course I wasn't there - you guys are the best judge, but to me rotation was not discernible from video. I have seen many storms which exhibit 'bouts' of lazy rotation, but that is a far cry from a storm that means tornado business. If I have to do a double take, and squint and stare to make out rotation, then I suppose I just didn't find it all that impressive although in all cases it is interesting (here I am talking only about such storms I have seen with my own eyes - not judging your example as I know alot can be lost on video). That is what I ask myself all the time. But what is different about these monsters to the ones each of us has been under at some time where nothing obvious has happened? (I mean nothing in terms of rapid rotation) - I just wonder why should there be anything going on under these ones?. I think that we do get our fair share of superell thunderstorms. As an aside, when I was drivng around last year, from western Oklahoma all the way up to Nebraska and beyond, I came to the conclusion that the population density in these parts is not all that different to say, SE QLD, the northern rivers, northwest slopes (near the ranges) or the Hunter. You are right. If this was 1993 - perhaps we would be considering the fact that Brisbane storm chasers, five months earlier had bagged some violent tornadoes near Bucca, and how our SA group got that monster on video (or would we have missed then all??). But would our perspective of what is 'normal' be distorted then or is it being distorted now by a lack of tornadic storms. I know that big day will come - again my whole point is how often??. The tornado which demolished the house I was in at Geelong (Vic) in 1946, travelled in a SE direction as it was seen by the neighbours as approaching from the NW and did further damage SE of the house. I was too young to have any recollection of it myself, just relying on my grandfather's oral reports. I don't have any knowledge of track details except that it travelled at least 4 km and probably further. An interesting thing about the SW'ly jets in the US - I guess for one the Rockies really help with the upper level troughs (again due to the PV equation), but Australia also receives nice upper level troughs, however - if they exhibit a strong NW'ly jetstream that is present too far north, it taps into the tropical moisture. As many are aware - the stronger winds/jet overlying slower winds create vorticity which lifts the air up from underneath it, cooling and (if the air is moist enough, which it often is in the tropical areas), condenses it. I guess think of waving your hand over a page in a book very quickly and the page will rise/flap over. Just due to the nature of upper level troughs, NW jets tend to have the areas of divergence/diffluence - and SW jets tend to have areas of convergence/confluence (but not always, this is just an ideal model of an upper level trough), the left entry region does give some lifting also. The delta region (right exit of the jet), is present in NW'ly jets, and is often one of the most favourable areas. However, it is one of my least favourite jets! Purely because for us it brings in too much upper moisture, and often is associated with cloud. Sometimes it produces too much rain. However - in these situations, inland Australia has often taken off beforehand, so one would wonder what lies under some of the cells that have formed before the rain previous to that. I prefer SW'ly or W'ly jets (even though it normally means most of the cold air is to our S), purely because we don't get the cloud. We just have to rely on our DP's being a bit higher to help add some extra instability. Taken with a 35mm point and click at Noosa. This is a pan shot with 4, 28mm lens photos digitally joined together - taken from near Pittsworth (in the Darling Downs). I have yet to contribute anything to this thread as my knowledge just doesn't give me an opportunity. But I have to agree that the sharing of information and the level of healthy debate has made it a very interesting read and one that is hopefully going to give us a whole army of knowledgeable tornado/funnel spotters. But to pick up on the point of Matt Smith in his email yesterday afternoon. The collection of data to form a nation-wide map of tornado tracks probably should be something for all of us to share the workload on, as I'm sure if we were all to dig we would find quite a bit more anecdotal evidence to point to tornado damage. So the point I'd like to raise would be, why wouldn't everybody who has the time and interest to help get together and divide the nation into much smaller areas where we would each research possible tornado activity over a set time into the past and likewise going forward. Maybe this would be something which each state branch of ASWA can coordinate and hopefully there would be a reasonable enough of a spread so that most people who don't work at bom or other, would be able to research the areas where or closely nearby to where they live. But this would be up for anyone to work out. We should try to run it as an organised project and set a targeted completion date, how the data is to be presented, etc, etc. Matt, I'm not trying to give you a job, but I'd see you as an overall coordinator as long as this project didn't become bigger than Ben Hur, and being able to place the info on the ssc page as you had planned. I would be very interested to hear of your feedback on this idea as I feel it would have some other benefits to all of us, which might include the gaining of true knowledge of local conditions which are more likely to produce tornadic events or other severe weather, eg the Illawarra escarpment, or Hunter Valley areas. I'm sure this information in itself will be of great use at some stage down the track. Anyway, I'm sure this is enough rambling from myself, but I'd nominate myself now as researching the nsw south coast area, down to whatever point unless someone wanted a pice of the action. As an aside, Matt Smith has been compiling a tornado archive of the occurences in the Eastern States for the past few years. Its an interesting read. Its something that Matt is always working on and its a great place to start when it comes researching Australian Tornadoes. You are not rambling Andrew. I think it is a good point. We had tried to start up a snow group last year but it never got underway. I feel that people should form a yahoo group for this project and then things might happen. Iwill let someone else take charge as I tried unsuccessfully last year so perhaps somebody else will have better luck. That is a wonderful pic of a funnel and it clearly shows cyclonic rotation ie it is going the right way so to speak. Well done. As Matt Smith says, it has a nice dry slot which helps in descerning the direction of rotation. Which direction was the storm moving and which way are you facing? This also illustrates one of the frustrating things. So close and still a couple of trees and hills in the way. Just remembered that was the same day Robert Goler got his funnels. I wonder if there was no thunderstorm associated with it regardless of the fact there was no lightning. There is precipitation evident. Do you have a photo of the whole cloud or one facing a different direction. I take it you were facing NW in those photos. How about S at the same time or similar time. Helps immensely in deciding where this was in association with the parent cloud. The funnel was moving SE and the photo's were taken facing roughly W-NW. I think this is going to come down to a fairly common thread in this discussion (and I think I have talked about it before), but Australia and the US both tend to use different types of CAPE. US forecasts tend to be orientated towards surface based calculations. Australian forecasts tend to be orientated towards PBL (Planetary Boundary Layer based calculations). IE the commonly accepted Australian methods tend to take into account the moisture in the lower 50-100mb of the atmosphere to get a representative measure of heat and moisture. As if you have a dry layer just above the surface (for example during seabreeze situations on a dry day), the moisture at the surface really isn't representative of the *mixed* parcel that would ascend into the atmosphere. For example, if you had a 4L bucket of cold water at 10C, and you added 1L of hot water at 60C, and took the temperature at the top, you would get a much higher temperature then if you mixed the 5L of water together and took the temperature at the top. I tend to always take an average of the bottom 50-100mb moisture depth when I look at skew-T's, otherwise I believe that if you plotted strictly using surface observations, if there is drier air just aloft you will get an over-estimated parcel ascent. Given that CAPE is essentially the area between the parcel ascent and ELR (environmental lapse rate), then subsequently your CAPE is adversely effected. One example of US CAPE and AU CAPE that comes to mind was the flop in April in the US when the SPC had a high risk out for some areas. CAPE was 2000-3000 in quite a few areas, but I was surprised when I looked at the soundings how shallow the moisture layer was! It was barely 100m deep, and was way too shallow. The same sounding in Australia would have given CAPE's perhaps around 1000 if that. So this can make it difficult in even comparing CAPE calculations between the two areas! But if you brought Australia and US in line with each other in regards to CAPE, I honestly believe that you will find that Australia will come out in front in regards to high CAPE. With DP's often getting into the low 20's, sometimes mid 20's in the coastal severe storm areas, and even inland getting DP's in the high teens and temps in the high 30's or low 40's, CAPE's can get quite high. NE NSW and SE QLD tend to be a nice high CAPE corridor. While we don't get huge upper level troughs very frequently, during Nov/Dec events we tend to get coldish upper temps (-10/-12C @ 500mb - sometimes less) and DP's are in the low 20's and temps in the low 30's - you get some very nice CAPE's (4000-5000 is not uncommon). You require a fairly deep moist layer, but that is fairly common, especially if PBL airmass over the Coral Sea is transported over the area - this can happen quite quickly if there has not been much injection of southerly air over the Coral! Assuming surface CAPE calculations, Some areas can get CAPE's towards five figures along the east coast (more so towards Capricornia regions), with their mid-high 20 DP's! More importantly, I think that CAPE in Australia tends to be utilised more so than in the US. In the US, you need a front/trough/dryline mechanism to break the cap because it's so strong. We do have strong cap days here (with favourable upper atmospheres for storms), and that can be broken by the ranges. 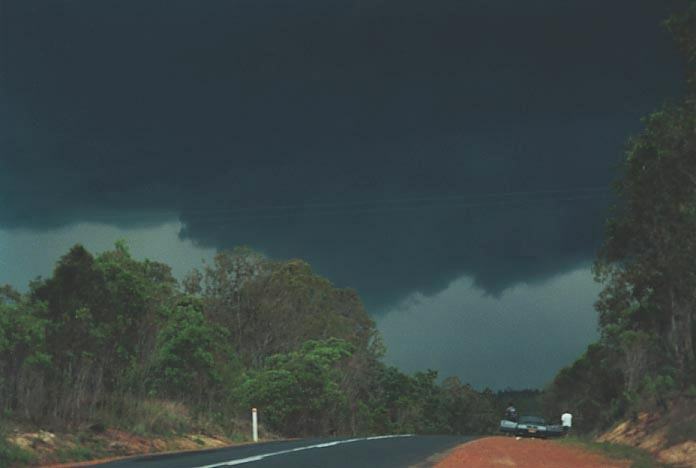 The ranges along the east coast of Australia certainly get their fair share of severe storms, and the population density is even less in these regions, with limited (treed) roads. Often in the US, the highest CAPE values go to waste because the cap is too strong, rather the more modest CAPE's tend to get the chance to break the cap. Then again, if the cap does break over the big CAPE areas (and shear is somewhat supportive)...they have had some biggins! Back to the CAPE subject - I think the other thing that makes it hard is because we don't have reliable CAPE forecasts. The aviation model does CAPE forecasts, but I have found them incredibly inaccurate, often only giving small areas of frequently under-estimated CAPE. I don't know if it has something to do with their equations, or whether or not it's just because its not calculating/evaluating the surface moisture properly. Note that LI's suffer from a similar fate of inaccuracy, but is certainly less noticable than CAPE inaccuracies. Probably because a small inaccuracy in the surface moisture profile can lead to huge inaccuracies in CAPE (over 500-1000!) Hence why I tend to calculate my own CAPE. Just thinking about this, I also wonder if the way we forecast storms tends to be different to the way US chasers forecast their storms. For example, US chasers tend to primarily only be after one thing - tornadoes! Where as Australian chasers have always been happy with an impressive storm - and we just forecast where we think the best storms will be. I don't often sit down and think "Now if I want a tornado, where should I go?" But it's difficult to do that simply because we don't have data at a fine enough scale to do that! I tend to just be happy knowing there's 2000 CAPE there for instance, I mean one of my forecast/chasing thoughts is once it gets to a certain level it doesn't really matter how much - just as long as its unstable! However it can have some big effects - obviously there's a big difference between 2000 and 3000, but not between 2500 and 2800. We simply don't have the georgraphic setup to produce those frequent high CAPE days, which, as Anothony was noting in another post, can make up for a lack of any dynamic effects. Hence, I agree with Jimmy's quote that an "F3 (oz) is as significant as an F5 (US)". Hi Phil - Do you have a particular date in 1946? All of my searching fails to find a tornado in that year in Geelong. There was however a severe storm with strong gale force easterly winds (around 90 kph) on 18-1-46 which caused a great deal of damage to houses, trees, etc. On the 25-2-46 there was a severe "electrical storm" through the Lorne-Geelong region which caused damage and at least 3 casualties. Other than that there was a very severe wind event in 1948 which demolished houses and uprooted trees right across the urban area, hospitalising 4 people. But it was never described as a tornado. The Geelong Advertiser at the time said it was "the strongest wind since the Highton Tornado of 1926." Regards, Lindsay Smail. It was definitely the 1948 event. I would very much like to find out the exact date if you can look it up, as my Grandpa only narrowed it down to "when Phil was a baby" and couldn't be more specific. I lived at 9 Bloomsbury Street Chilwell from September 1946 until December 1948. The main part of the house was then a thick walled stone or concrete house with a slate roof having no eaves around it. The front half of the house was a poured concrete slab with mosaic tiling on top which had then had a big timber verandah with a corrugated iron roof built over it. This had then been built in with some sort of timber siding and divided into a hallway and two rooms. I was in one of the front rooms asleep when the tornado hit. The rest of the family were in the main part of the house. Grandpa used to tell it something like this: It became so dark by three in the afternoon that they had to light the lamps (not commonly done in the daytime by my penny-counting grandparents). A couple of times they went outside to look at the very dark and fast- moving clouds. They were inside when they heard a noise "like a dozen goods trains rolling downhill out of control". The noise became unbelievable as everything outside seemed to be getting blown away. Someone yelled out "Pray for the baby!" As the noise abated, someone thought to check up on me. They opened to door and found the whole front of the house absolutely missing - not a trace of walls, roof, windows - every stick of furniture vanished - except for one single item standing untouched under the open sky on the mosaic floor. My pram was still exactly where it had been, with the mosquito net still in place, and yours truly still sleeping peacefully inside. The neighbours had seen an enormous black column of rotating cloud approaching and had dived down into their cellars to escape. Grandpa said a lot of damage had been done. My Grandpa always used to tell this story to explain why I have been a weather nut all my life. To place things into context more once I have heard on TV shows " I have lived in Oklahoma all my life and have never seen one before "
I suppose we tend to think that they are so common that everybody has had a brush with one. I must say that NW jets are too often moisture gravy trains. I was thinking that if we can get ocean temperatures off the NW lower than normal we may jet drier NW jets - or will the jets themselves be a vcitim of the cooler water. Why I am thinking this is because at present parts of the Indian are cooler than normal, if this were to persist until Spring and even move more north ? Your thread below would be a great topic for the AGM, some overheads , etc on the characteristics of the jets you describe. The seabreeze is one of my pet loves and hates, I think you are onto something with saying that the seabeeze can be both a storm inhibiter or a storm assistant. My experience in Wollongong is that the seabreeze will act as dreadful inversion, sometimes only 800-1000m thick, and the cumulus/storms in the first line against the seabreeze are often the strongest. The classic example I can think of is the 11th December 1996.
this day was memorable as the BOM had warnings out on almost the entire state ( or was it the whole state ). I travelled from Wagga to Wollongong that day and the cumulus was suffering for most of that distance through lack of moisture. Most of the very severe storms that day fired along the seabreeze boundary. The sat pics on Australia Severe Weather show this. I suppose with seabreezes it is easy to be critical of the sea breeze when you ignore what the steering winds are doing. Weak to zero steering winds will see bugger all storms on the maritime side of the seabreeze. Any storms would propagate back west riding the seabreeze. However with good steering winds pushing the storm into the pool so to speak the storm itself will break the seabreeze inversion and use the moisture. Looks like some RFD action *may* be apparent - very nice. I can't talk about the NWS but when forecasting here, we certainly mix the PBL. In fact, check out www.rap.ucar.edu/weather - goto upper air and the charts have automated LFC etc and you can see this product does mix the PBL - of course, it is not NWS. This is intersting, i know the other day i said that I thought the US had a greater frequency of high CAPE days and i'm still out on that one - some climatological analysis would be nice here - maybe after exams :) But I have always been adamant that Aus get's higher DP's near the coast than any US site - do we get high DP's inland up north? However, i guess the importance is formation regions rather than just a comparison of who can produce higher CAPES that never get utalised *or* goes off everywhere and the storms become vapor starved. Also, the comment about requiring dynamics to break the CIN is true but by no means the only forcing - it does get bloody hot on the plains and breaking the cap is not uncommon. I wouldn't agree here. Most chasers here are very satisifed with an LP - a tornado is a bonus. But picking a target to maximise the chance is always the name of the game - but i think that has a lot to do with the fact that you do ahve a real chance of seeing one whereas in oz it is more the luck of the draw. Again - back to the argument of # of tonadoes in oz vs US etc. But I have always been adamant that Aus get's higher DP's near the coast than any US site - do we get high DP's inland up north? As you go further NW into the "Survivor Outback" :-) the network of obs gets less and less dense. But one station comes to mind, Julia Creek - guestimate, 700-800km W of Townsville, 400km S of the GoC. I remember making a comment on its afternoon obs how dry it was because the DP was only 24 :) The DP's tended to be 26-28 there most afternoons, but of course it has the upper level tropical ridge on it. Did you know that Mt Isa (250km W of Julia Creek) averages one severe storm a year? This is interesting (yes I know Mt Isa is the largest city in the world...but this is the actual town/city itself), given that actual centre is quite small, it's a fairly high frequency for somewhere very close (if not in) the tropics! Apparently they can get on the edge of some jetstreams, and storms can be quite severe. Just an interesting aside I thought :) Given the relative size of Mt Isa (I'm not sure what it'd be, less than 10,000 though), it'd be like a suburb in Brisbane/Sydney averaging a severe TS once a year (and some suburbs do...). I guess my opinion of this is somewhat flavoured by the weather-chase list and listening to many of the Americans forecast, and reading their reports. Often they tend to tone down any report that didn't have a tornado. Keep this discussion coming! - its about as close as we sould in SA are going to get to severe weather in the next week or so [or in the last month or so for that matter], enough of this slack pressure field I say! Anthony just mentioned Julia Creek as an inland place with high DP's and I'm surprised he didn't comment on our last Thunder Down Under chase. We spent nearly the whole first week chasing in W NSW and W QLD (as far W as Burke - Cunnamulla - Charleville - Alpha) and from the moment we got out to Burke the DP was above 20 for the entire time. Yes, there had been a lot of rain and flooding out that way which would push the DP up above normal. One morning we woke up the day after Charleville had had its highest daily rainfall total (for any month?) of 99.3mm (i think) and from 6:30am until 8:30am, temp and DP went from 20/20 up to 24/24 before the DP stopped going up. By midday we had obs of 31.5/24 which is fairly impressive by anyone's standards. We saw a few supercells this day and a wall cloud and funnel (or 3 ). A few days later saw us out W of Rockhampton near Emerald. A quick check of the obs at one point saw the temp sitting on 29C whilst the DP peaked ever so briefly at 27.2C but averaged 25C. Unfortunately this day the road network killed us. THe storm to our SW was textbook multicell and although briefly trying to go the next step, it never made it. We still say a HUGE microburst and some of the best pileus you'd ever see. I'm not entirely sure why. There was another much larger and more persistent storm to our N but the roads just couldn't get us there. Anyway - that's my vote for the western areas. They do get high DP's but how regularly....who knows but the trees. I guess over the next 3-5 years when doing chases out there we may start to see a pattern but we can only wait for the weather to take us back out there. There is stacks of information here, but I guess the parts relevant to this thread are the maps of occurrence of severe weather within 25 miles of a point. For example, many points in central Oklahoma can expect 7 to 8 days per year with severe hail (> 2cm) within 25 miles (this is the highest for the country). If you look at giant hail (>5 cm) the figure drops to about 2 or 3. For severe convective wind gusts, you initially may be surprised to find the main peak is not on the great plains (although there is a peak here too), but rather through the southern great lakes, Ohio and Indiana. This is due to MCS or derecho events that produce widespread damaging convective wind gusts. Well, cutting to the big stuff, i.e. significant tornadoes (>= F2), not surprisingly the peak is in central Oklahoma, and the value is around about 30-35 days per century. So I guess you could look at it that if you lived in central Oklahoma all your life and never went away, you would expect to have about 30 or so significant tornadoes pass within 25 miles of you. If you look at only violent tornadoes (F4 or F5) this drops to about 4 or 5.